The Largeflower Heartleaf is a small evergreen plant that is prized for its variegated evergreen foliage. Native to the Southern Appalachian Mountains, this small woodland plant can grow in deep shade and acidic soil. It is a clump former that spreads slowly by stolons. While it does take some time, the plant will eventually form a dense clump or mat that can serve as a multi-season groundcover in shade. 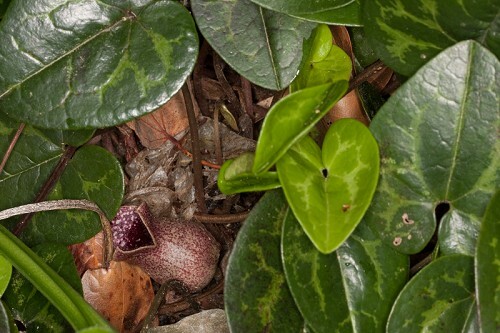 This heartleaf has triangular trumpet-shaped flowers which live up to the Heartleaf’s alternate name “Little Brown Jugs”. These speckled, dark purple flowers, although interesting, typically develop under the leaves which are held about 3-4” above the ground. While the flowers may be easily missed, the leaves are very showy with their dark green edges and white venation. Grow this little plant as an accent or a ground cover in areas of shade. Some dappled light will produce better variegation between the dark green leaf edges and the silvery white leaf veins. The plant is best suited for moist soil with a low pH. Mulching the plant with extra leaf litter in the winter may help protect the plant in colder climates. While this heartleaf is slow to establish, the clumps that will eventually form can be divided to make more plants.